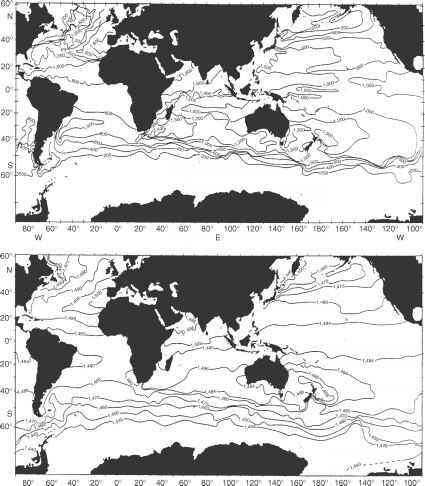 Figure 2.6 Sound speed profiles (winter and summer) and T-S comparisons for the North Atlantic Ocean near 23° N, 70° W (Naval Oceanographic Office, 1972). Figure 2.7 Schematic relationship between profiles in the deep ocean. temperature and sound-speed increases with increasing depth). In this region of the water column, the sound-speed profile becomes nearly linear with a positive gradient of about 0.017 (ms-1) m 1 or 0.017 s 1. Between the negative sound speed gradient of the thermocline and the positive sound speed gradient of the deep isothermal layer is a sound-speed minimum. The depth corresponding to this sound-speed minimum is referred to as the sound channel axis. At high latitudes, the deep isothermal layer extends nearly to the sea surface. That is, the sound channel axis shoals as one approaches the polar regions. This behavior is vividly demonstrated in Figure 2.8. The top panel presents contours of the depth of the minimum sound speed (m) and the bottom panel presents the sound speed (ms-1) on this axial surface (Munk and Forbes, 1989). At low latitudes, the depth of the sound channel axis is typically near 1,000 m. At high latitudes, the axis is located near the sea surface. The associated sound speeds on this axial surface generally decrease away from the equatorial regions. In profiles containing a sound channel axis, a critical depth can be defined as that depth below the axis at which the sound speed equals the near-surface maximum value. (The near-surface maximum value of sound speed is usually located at the SLD.) The vertical distance between the critical depth and the sea floor is referred to as the depth excess. Other pairs of points can be identified on the sound-speed profile that have the same value of sound speed but which lie on opposite sides of the sound channel axis. Such pairs are referred to as conjugate depths. In Figure 2.7, the critical depth is actually a conjugate of the SLD. Figure 2.8 Global maps of the sound channel axis. Upper panel: channel depth (m). It is convenient at this juncture to discuss additional points of morphology relating to the sound-speed profile illustrated in Figure 2.7. These points will be useful in later discussions concerning full channels, halfchannels and ducts. 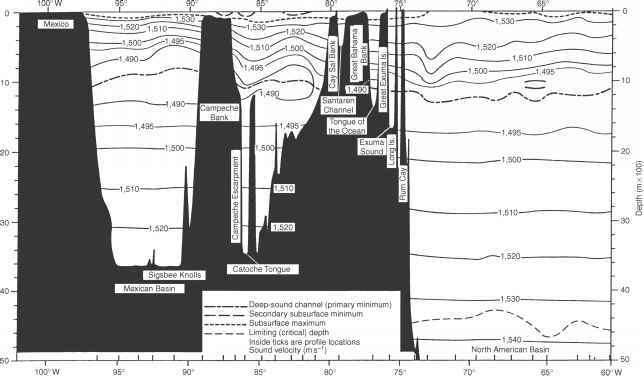 A full channel is formed around the sound channel axis and, for purposes of discussion, is limited above the axis by the SLD and below the axis by the sea floor. Either the upper portion or the lower portion of the full channel represents a half-channel. The upper half-channel is characterized by a negative sound-speed gradient (as is found in some shallow-water regions) while the lower half channel is characterized by a positive sound-speed gradient (as is found in the Arctic or in some shallow-water regions). In Figure 2.7, the sea surface and the SLD define, respectively, the upper and lower boundaries of a duct. The properties of acoustic propagation in a full channel, half-channel and duct will be discussed in Chapter 3. 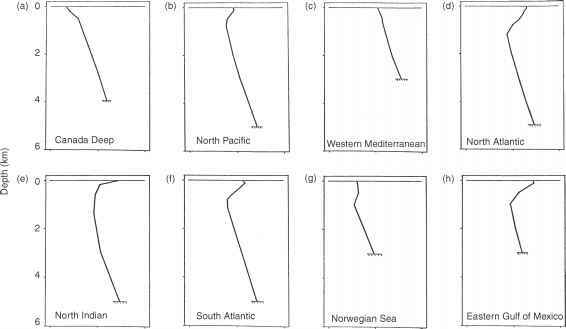 Additional sound-speed profiles typical of the winter season in different ocean areas of the world are presented in Figure 2.9. These additional profiles demonstrate that the simple model described above (specifically in Figure 2.7), which is representative of many tropical and sub-tropical deep-ocean areas, is not applicable to high-latitude ocean areas or to some smaller water bodies. The depth dependence of sound speed in the ocean poses a particular problem for echo sounders, which use near-vertical acoustic paths to measure the depth of the sea floor based on the two-way travel time of the signal. Echo sounders are set to read the depth directly by assuming a constant speed of sound in the water column, usually 1,463 or 1,500 ms-1. When the actual depth-integrated (or mean) sound speed departs from the assumed value, a correction must be applied to the observed readings. Bialek (1966: 63), for example, tabulated such corrections according to ocean area. Depending on the particular ocean area and water depth, these corrections can be on the order of several percent of the true water depth. It is important to check navigational charts to see if any such correction has been applied to the soundings. If no corrections have been made, then care should be exercised in ascertaining the true bottom depth before undertaking any deep-water operations in proximity to the sea floor. Underwater acoustic propagation problems involving long ranges may not be able to ignore horizontal variations in either the sound speed or bathymetry. Modeling developments, therefore, generally distinguish between range-independent (1D, where the ocean varies only as a function of depth) and range-dependent (2D, where the ocean varies as a function of both depth and range) problems. Parameters other than sound speed and water depth may also be considered in range-dependent problems such as surface losses, bottom losses and absorption. If, in addition to the 2D problem, there are azimuthal variations, then the problem is considered to be 3D. An east-west cross-section of the North Atlantic Ocean between 23 and 24° N is presented in Figure 2.10 to illustrate the variability of both sound speed and bathymetry over moderate range scales. Also noteworthy are changes in the depth of the sound channel axis and the absence of a critical (or limiting) depth in some basins. The sound-speed profiles presented previously in Figure 2.6 are consistent with the data of Figure 2.10 at a longitude of about 70° W.
Figure 2.9 Characteristic winter sound-speed profiles for selected deep-ocean areas of the world. Figure 2.10 East-west sound-speed cross-section between 23° and 24° N and between 60° and 100° W for the period February-April (Naval Oceanographic Office, 1972).